Extreme Carpet Cleaning provides professional upholstery cleaning in Baltimore and throughout Maryland. Our experienced technicians are highly qualified in removing tough stains while preserving the delicate fabrics of your fine upholstery. Why should upholstery cleaning be something left to the professionals? Reason #1 – If proper inspection of the fabric is not taken this could damage the item. There are many different types of fabrics and each requires special attention and solution cleanings. This should never be overlooked or attempted by anyone unqualified. 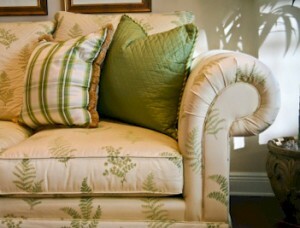 Reason #2 – To regain the beauty and softness of the fabric, making for a more enjoyable environment. Reason #3 – As with your carpet so should you routinely clean your upholstery, too often this is overlooked leaving furniture heavily soiled and making them seem dirtier than usual. Reason #4 – Annual cleanings or when furniture becomes soiled will protect them from permanent staining or spots while also allowing for the removal of dust, cigarette nicotine, and other built-up pollutants from outside sources within them, making for a cleaner and healthier environment. An inspection of the furniture is taken allowing us to determine which method of cleaning is suitable. We will look for any labels or manufacturer recommendations on each piece pointing out any trouble spots or existing conditions. We use several methods when cleaning upholstery. Our most effective and the industry standard is known as the Hydro-Kinetic. This method produces a high-velocity shearing action to efficiently remove soil from the fabric; it is unsurpassed in its cleaning ability and offers quick drying times. We do not recommend washing cushions in the washing machine. This will cause fading, shrinkage and could damage the fabric. Also, oversaturating from portable machine cleanings could lead to wicking, browning and potential odors. In most cases the factory applied protectant will deteriorate with professional cleanings. If you want your upholstered furniture to look its best and last longer it is recommended to re-apply these coatings after the cleaning has taken place. This will place a protective teflon barrier on the fabric allowing spills and stains to easily be cleaned by the homeowner. Do you have a malodor? In cases of pet-odors or any other malodors, we can apply a hydracide neutralizer, encapsulating and removing all odors from within the fabric. This process is applied before, during, and after cleaning to ensure complete removal. Depending upon the fabric and which method of cleaning was used your dry-times can vary. In most cases fabric will be dry between 4-6 hours unless aggressive cleaning was needed or deodorizers or protectants were applied after the cleaning. In these cases dry-times may be up to 24 hours.